what could a girl do with all that goodness to challenge her but make a card. Here is the image (S009 Bear from Kiwistamping), coloured with chalks, and sentiment (from Montarga), and close up of the bakers twine bow. I decided I did not like just the silver embossing, so applied some masking and silver sprayed the narrow panel ... very heavily. and I love the finished product!! I love how you did that gilded panel! I never thought to pair silver and kraft, but it looks great together! Thank you for playing along at STAMPlorations, Maxine! Locwly baby card, Maxine. A teddy always makes a cute baby card. Thanks for your compliment on my Craftchaos Blog. Very special and very cute Maxine! Such a darling teddy bear- fun baby card Maxine. The blue and kraft are so pretty together. 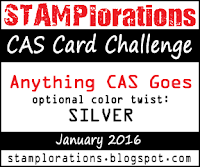 I also like the silver panal; it makes it a beautiful-not-too-sweet card! Enjoy the weekend! Super cute! Don't you just love challenges! The teddy is adorable and I love the design with the baker's twine! Precious! Lovely Bear! thanks for sharing with us in House of Cards! enjoy!! Paula, DT. So cute.Thank you for joining us at Crafting from the heart. This is so lovely! I love the techniques you used. And that bear is too cute! Lovely card. I enjoyed seeing all the techniques. Thanks for playing along with us this week at Craft Your Passion. Hope to see you again. Good Luck. What a beautiful project with so many wonderful details! Thanks so much for sharing your talent with us in the Love To Scrap! Challenge Blog's "New Beginnings!" challenge this time! Sometimes simplicity says it all - job well done! Thanks for joining the Craft-Dee BowZ January challenge. Great card, thanks for joining us at the Cutie Pie challenge. Maxine, I wouldn't call this unconventional, I'd call it contemporary. And beautiful at that. Thanks for joining us at House of Cards this month. I hope you'll join us again soon. Awesome CAS design, such a cute image and love the shimmer. Thank you for joining Lost Coast Portal to Creativity Challenge #20 Clean and Simple, hope to see you again soon. Ah, too cute! Looks like embroidered!! Thank you so much for joing us at House of Cards.